A modern take on the classic French pastry. 1. Preheat oven to 375°F. Line a baking sheet with parchment paper. Set aside a second, identical sized piece of parchment and baking sheet. 2. Start assembling the phyllo “cookies”. In a small bowl, combine sugar and almond flour to form an evenly mixed dust. Set sugar mixture aside. On a large, flat, clean work surface, place a single phyllo sheet down. Using a pastry brush, lightly paint the melted butter evenly on the top side of the sheet. Sprinkle 1/2 of the sugar mixture evenly over the butter, using your fingertips to gently distribute it as needed. Place the second phyllo sheet over, and repeat with butter and sugar mixture and top with the third sheet. Finally, brush the top layer with butter and evenly sprinkle the finely chopped almonds on top. 3. Using a round 3” ring cutter, cut 12 circular “cookies” out of the stacked phyllo sheets. Push the cutter down straight and firmly, twisting slightly if needed to form a clean cut. Using a small palette knife or spatula, carefully transfer the rounds over to the parchment-lined tray. Be sure to leave at least 1⁄2 “ space in between each round, and place them in a single layer. Place the second piece of parchment over the phyllo rounds, then place the second baking tray on top, sandwiching the lot. 4. Bake for 10-12 minutes on the middle rack, until the phyllo has crisped up and just barely started to turn a light golden. With oven mitts, carefully remove the top baking sheet and top parchment paper, and return to the oven for another 3-4 minutes, until the chopped almond topping starts to turn light golden. (Don’t walk away here! This only takes a little while, so stay close to the oven.) Remove from oven and let cool completely. 1. For speediest results, pre-chill a large metal mixing bowl by placing in the freezer for 5 minutes. 2. In chilled bowl, combine all ingredients and whip until soft peaks form. Keep refrigerated until assembly. 1. In a medium bowl, combine quartered strawberries, sugar and orange zest. Gently stir to combine and dissolve the sugar, and let stand at least 5 minutes to allow the berries to release their natural juices. Set berries aside at room temperature until ready to assemble. 2. For each serving, place a very small dollop of vanilla cream directly onto the centre of the dessert plate. Place a phyllo “cookie” on top of the cream, pressing down gently to prevent the dessert from sliding around. 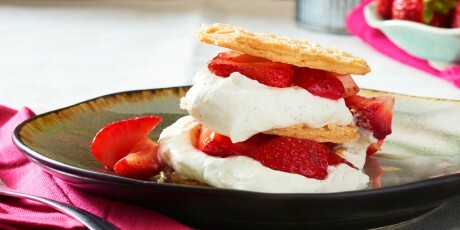 Top the cookie with a spoonful of whipped cream, then a spoonful of prepared strawberries. Top with a second cookie and repeat layering whipped cream and strawberries. Finish with the third cookie on top. If desired, dust with a fine sprinkle of icing sugar. Serve immediately.